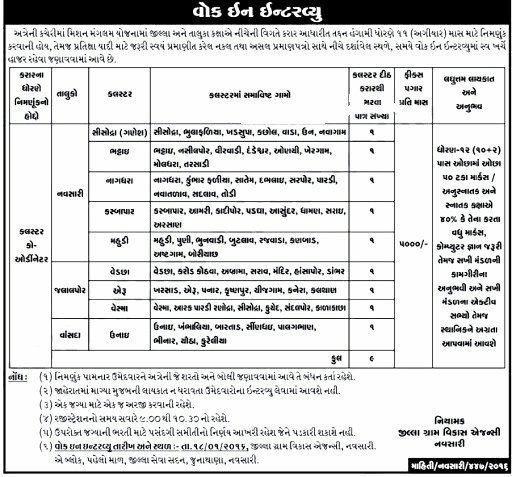 District Rural Development Agency (DRDA), Navsari published Walk in Interview notification for recruitment for below mention posts under Mission Mangalam Yojana on 11 months contractual bases. Educational Qualification: 12th (10+2) pass with min 50% marks / Graduation or Post Graduation with min 40% marks, Computer knowledge required. Preference will be given to the local person & active members of Sakhi mandal. Salary: Rs. 5000/- fixed per month. How to Apply: Interested candidates can apply & reach their for interview along with original & self attested copy of all relevant certificates to given below address. Venue: District Rural Development Agency, Navsari, A - Block, First Floor, District Seva Sadan, Junathana, Navsari.